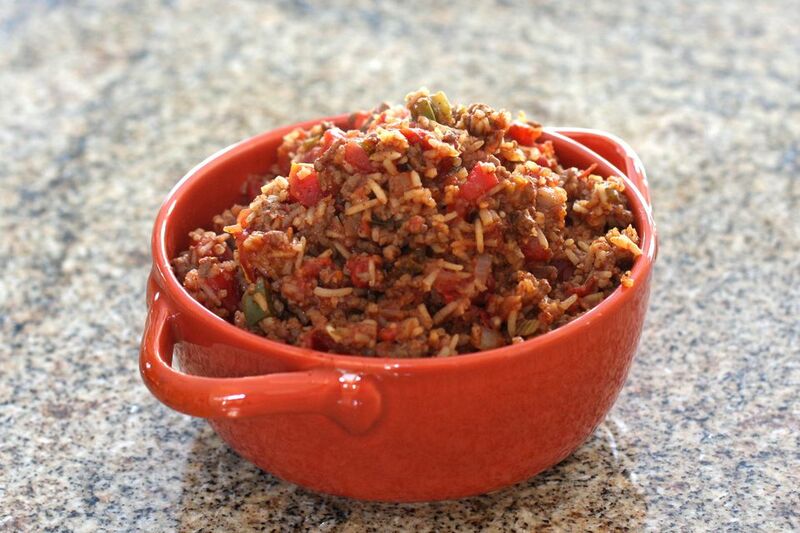 This Spanish rice is an American-style recipe made with ground beef, tomatoes, and seasonings. It's a simple skillet meal that cooks quickly. The Spanish rice can also be made with ground turkey, or leave the meat out and add more vegetables. In a heavy skillet brown ground beef in butter. Add onion, green bell pepper, salt, brown sugar, chili powder, pepper, and Worcestershire sauce. Cook until onion is tender. Add tomatoes and ketchup; simmer 15 minutes. Add rice. Cover and simmer 25 minutes, or until the rice is tender, stirring occasionally. Add a little water or tomato juice if necessary. Minute Rice Version: Add about 1 cup of Minute Rice to the skillet at the end of cooking time. Cover and let stand for 5 minutes. Fluff and serve.